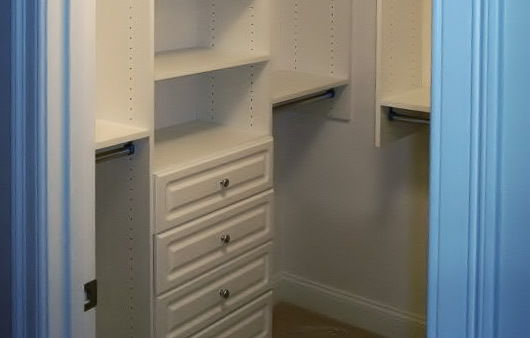 Customizing closet organizers and storage tips from Kustom Klosets in Massachusetts. Q How is Kustom Klosets prices compared to the other closet companies? A We offer very competitive pricing and pride ourselves in affordable solutions. We can work within your budget! Q What does the homeowner need to do to prep the area for installation? A The homeowner should empty the closet of material and clothing prior to our arrival. Q Who removes the existing (old) shelving? A Kustom Klosets will remove the existing shelving and dispose of it. We will also patch the walls where necessary. If you’d prefer to paint the closet walls ahead of time, we will still dispose of the removed shelving. Many customers chose to do this step and love the look of a freshly painted closet against the new shelving! Q After we decide on a system, how long will it take to get delivered and installed? A Typically it takes one week to have the material custom cut. Doors and drawers will take extra time, but normally we can install within one to two weeks after the final designs have been solidified and an invoice has been signed. Q Do you offer references? A After 27+ years in the business, yes we have many happy and repeat closet customers around Massachusetts. We are members of National Association of Professional Organizers. We’d be glad to furnish you with a list of customers who have used our services and are willing to serve as a reference and communicate with you. Q Where can I see some of your work? Q What is the difference between a wall mounted closet system and floor mounted system? A A wall mounted closet system will save you money simply because less material is used in it’s design. It will still create ample storage space and will have a custom closet look. A wall mounted system also easily allows a vacuum to run under it, and doesn’t interfere with future flooring changes. However if a custom “built-in” look is your desire, a floor mounted closet system may be a better fit. Q What kind of Guarantee do you offer? A Kustom Klosets unconditionally guarantees our design, product and installation for as long as you own it." We will repair or replace any product that has been damaged due to error/defect. Remember the purpose of the space you're organizing and organize that space for that purpose. De-clutter – if you haven’t used it in over one year, it’s time to rid yourself of it. Somebody else could probably use it! Use long, medium, double and short hang areas to maximize closet space. Organize it - Work smarter not harder by creating a space for everything. Decide what is important and make sure your closet provides the solution.